These banana parasols are as practical as they are stylish, sure to look fantastic in any outdoor setting. Available in a range of sizes with a 360 degree rotating mechanism and/or tilting functions, these hanging parasols will provide maximum shelter for you and your guests. Tropical sun is no match for our luxury side post parasols – browse the range below and order online today. These banana parasols are available in a range of bright colours to suit any garden, patio, pub or restaurant. These hanging parasols have been built to stand the test of time, featuring robust poles and air-vented canopies for stability and durability. 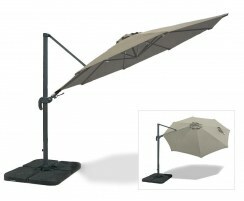 These side post parasols will provide comfort and shelter so you and your guests can dine without the sun in your eyes.